Tired of your usual lunch break? 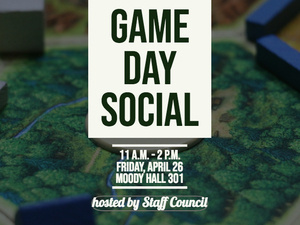 Meet up with Staff Council and your co-workers for a relaxing board and party game social. Bring your lunch and we’ll provide the rest — namely, desserts and a casual atmosphere to get to know your colleagues across campus. The event is come-and-go and open to all staff and faculty. Why are we doing this? Staff Council is dedicated to creating meaningful connections throughout the campus community and fostering an inclusive, healthy social atmosphere for St. Edward’s employees. Sometimes, that requires larger initiatives. Sometimes, that takes the form of board games.